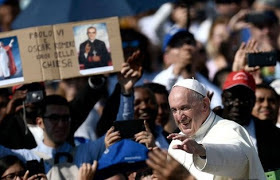 Pope Francis on Sunday praised two prominent figures of the 20th century Catholic Church as prophets who avoid wealth and look to the poor while shooting at Pope Paul VI and cite Salvadoran archbishop Oscar Romero. Francis proclaimed the two saints in the Mass at St. Peter's Square before about 70,000 believers, a few presidents and 5,000 Salvadoran pilgrims who traveled to Rome. Tens of thousands of Salvadorans remained at night in their homes to watch on giant television screens outside the San Salvador Cathedral where Romero's remains are buried. In a sign of the strong influence of Paul and Romero on the first Latin American father in history, Francis wore the blood-stained rope worn by Romero when he was shot in 1980 and also used Paul's staff, shirt and clothes. Paul led the reforms of the modern polarized church after the 1960s, while Romero was killed by the right-wing death squads in El Salvador for his courageous defense of the poor. In his homily, Francis called Paul "a church prophet turned out" to take care of the poor away. He said Romero had given up his security and his life "to be close to the poor and his people." He warned that those who do not follow their example to leave behind everything, including their wealth, never risk finding God. Francis said: "Wealth is dangerous, and says that Jesus - to make salvation difficult." He said: "The love of money is the root of all evils." "We see this place where money is in the center, there is no place for God or for man."